If you’ve ever walked around a forest, under tall trees, you’d notice there isn’t grass growing there, right? That’s because all those trees had their leaves fall to the ground where they created what’s essentially a “no grow zone” for grass. For grass to grow, it needs light. When a whole bunch of leaves cover the ground, the sunshine is blocked out and grass cannot grow like it normally would grow. Therefore, it dies off. Dead or decaying leaves that sit on the ground for a long time tend to hold moisture and block light from the ground. You get a sort-of “dead zone” of turf. Now that might be fine for a remote forest, but when it happens to your formerly lovely front lawn, it can be unsightly and/or end up messing with your home’s resale value (“What happened to their lawn?” buyers will say). Leaf mulching and/or removal is important. 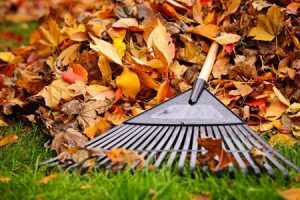 With mulching, you’re grinding up leaves and returning some nutrients and organic matter back to the lawn, so that’s a good thing. Mulching should be done when leaves are dry rather than wet and matted down. Mulching should be done in the fall when it makes most sense. Better yet, if you’ve got tons of leaves on your lawn, it’s smarter to just have them removed once and for all. They can be blown, raked, bagged and/or hauled away in trucks. VistaPro offers leaf removal as one of our services. VistaPro can get rid of dead leaves, twigs, and other unsightly debris. Leaf removal is important for the prevention of damage to your lawn, shrubs and plants throughout the winter. Serving Maryland, Virginia and the Greater DC region, please use VistaPro’s contact page to get in touch and ask about leaf removal services, If you think it’s too late to be done this year, there’s always next, and it’s good to plan ahead. Why Should You Irrigate Your Lawn? Interested in receiving landscaping advice in your inbox?